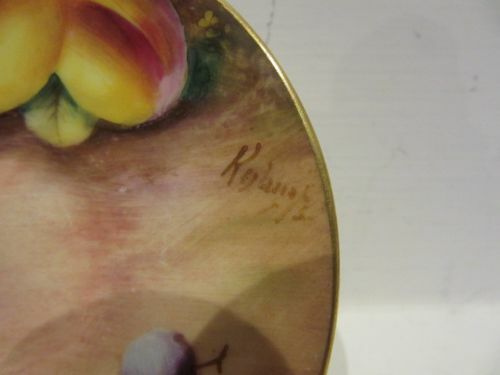 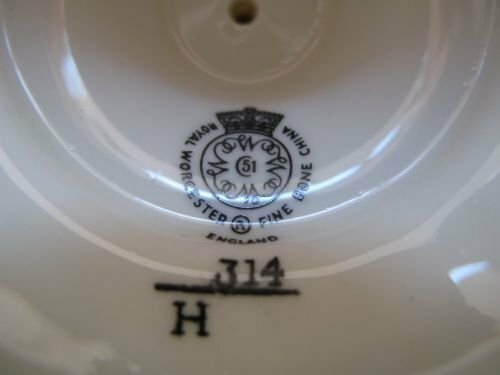 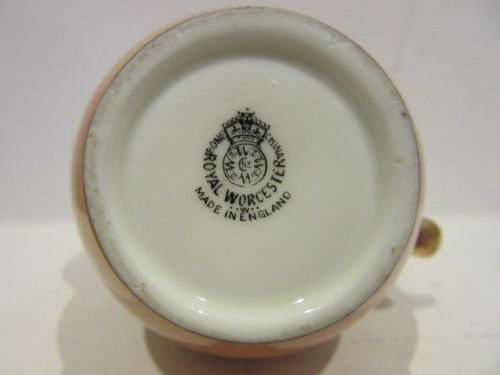 E) Royal Worcester- Blush Ivory and Miscellaneous. 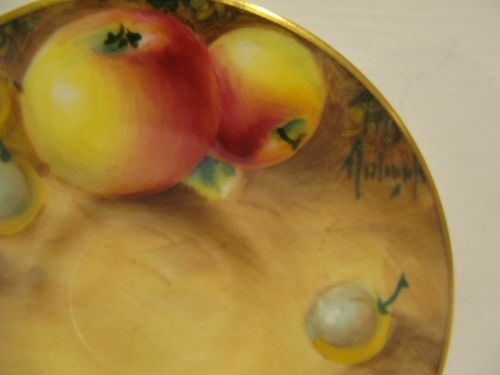 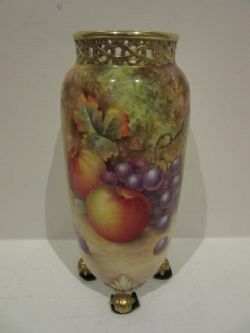 A Large Royal Worcester Fruit Painted Vase By M. Johnson. 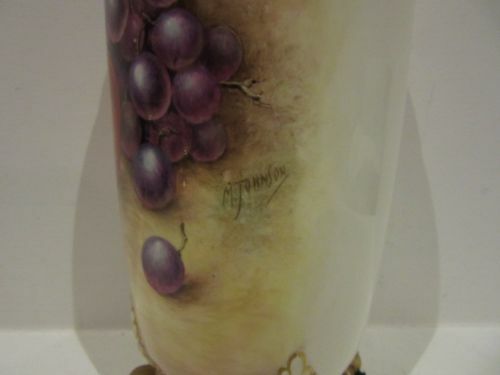 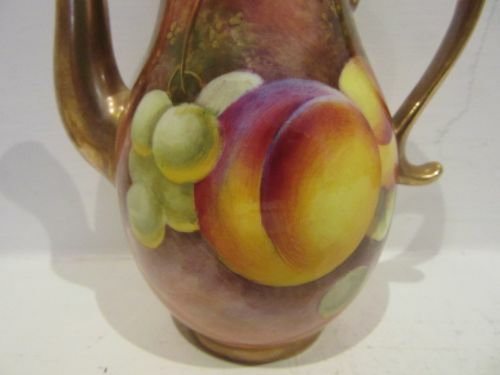 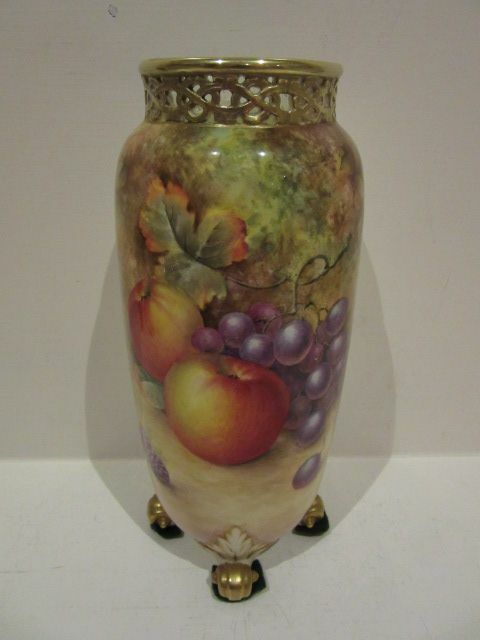 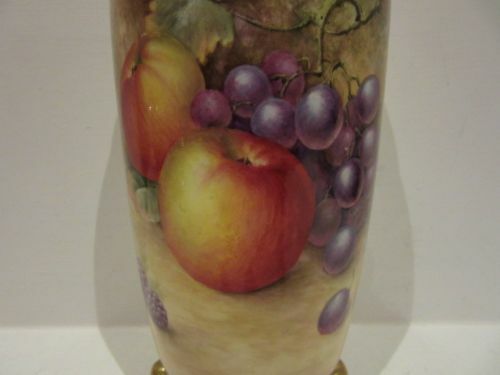 A good-sized Royal Worcester porcelain vase, shape number G42 L/S, the cylindrical body with reticulated rim is raised on 4 scrolling feet and has well painted decoration of apples, purple grapes and brambles against a mossy background by Malcolm Johnson. 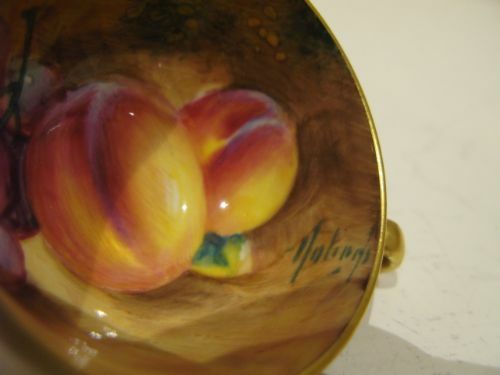 Measuring approximately 8.3/4"tall x 4"diameter, it has the black factory stamp for circa 1965 and is in excellent condition with no damage, crazing or restoration and the gilding is bright and virtually without wear. 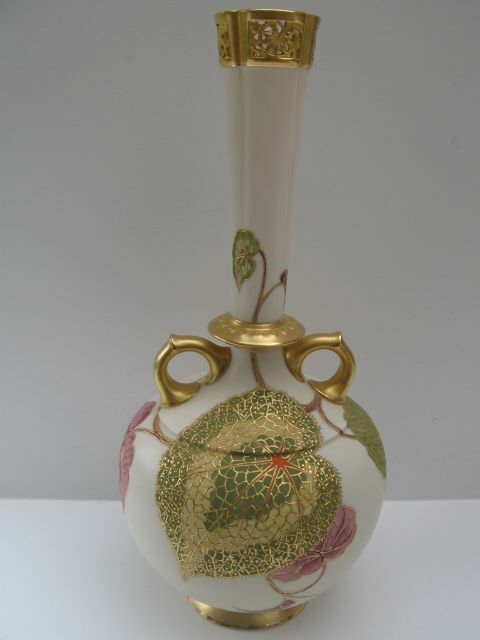 A Large Royal Worcester Reticulated Rim Vase. 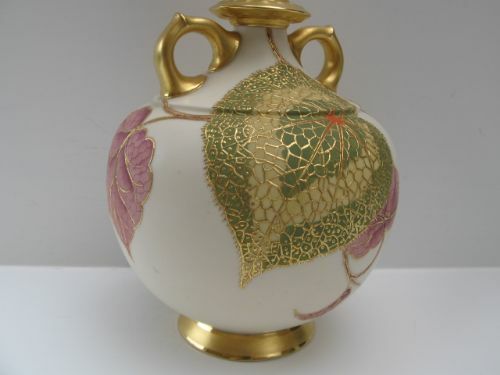 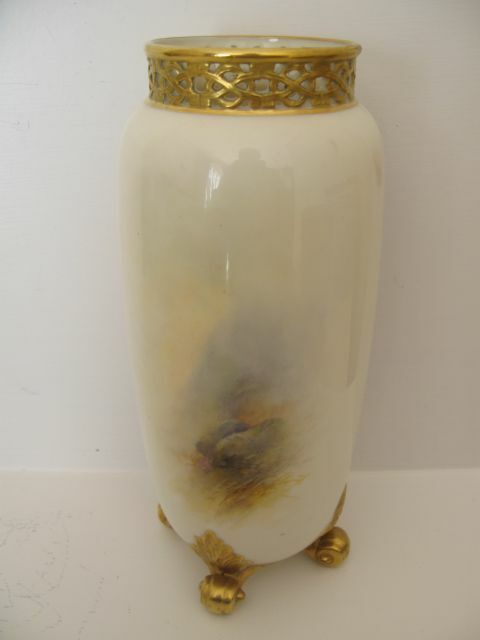 A most unusually decorated and attractive Royal Worcester ivory ground porcelain vase, shape number 784, which is described in the Sandon book as a "Persian Vase". 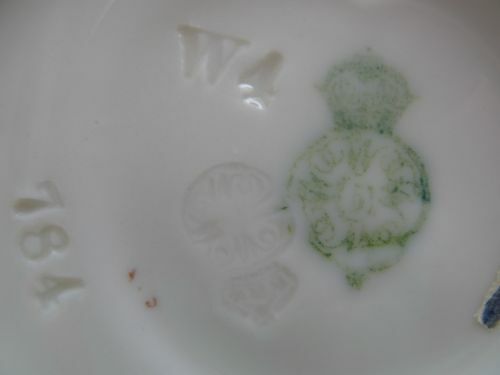 Measuring a substantial 14"tall x 6.1/2"diameter and with the dark green factory stamp for 1885, it appears to be in excellent condition with no damage, crazing or restoration and the gilding is probably as good as the day it was made. 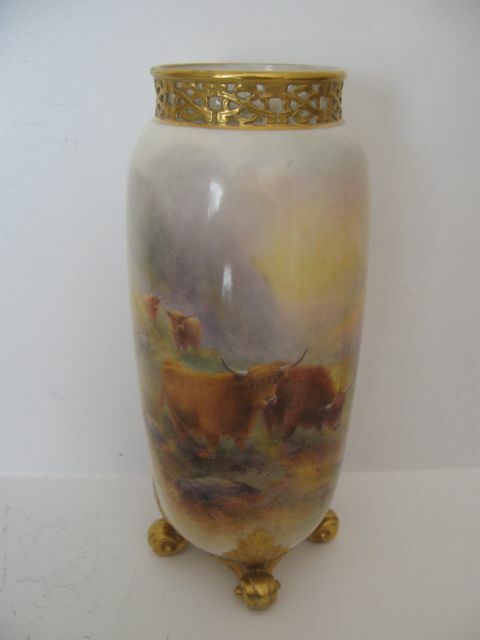 A Large Royal Worcester Vase With Cattle Painted Decoration By H. Stinton. 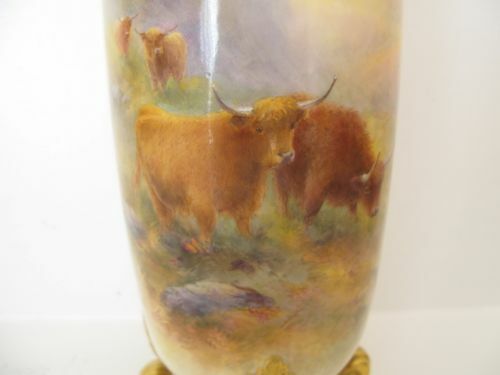 A large Royal Worcester reticulated neck porcelain vase standing on 4 scrolling feet, shape number G42, with well painted Highland Cattle in a mountainous Scottish setting by Harry Stinton. 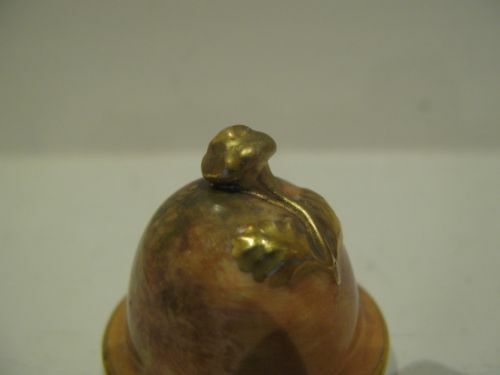 Standing approximately 8.5/8"tall x 4"diameter, it has the puce factory stamp for 1937 and is in excellent condition with no damage, crazing or restoration, and the gilding is bright and without wear. 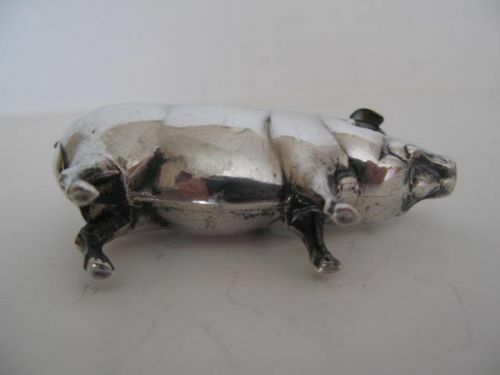 A Large Silver Pin Cushion In The Form Of A Pig By W Myatt & Co.
A good sized Edwardian solid silver pin cushion in the form of a pig By W J Myatt & Co, and hallmarked for Birmingham 1909. 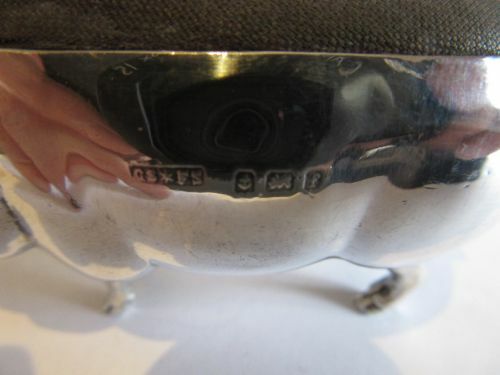 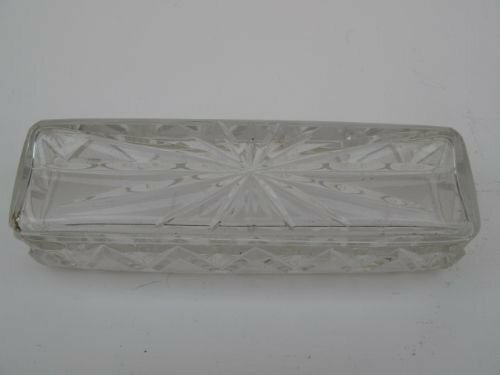 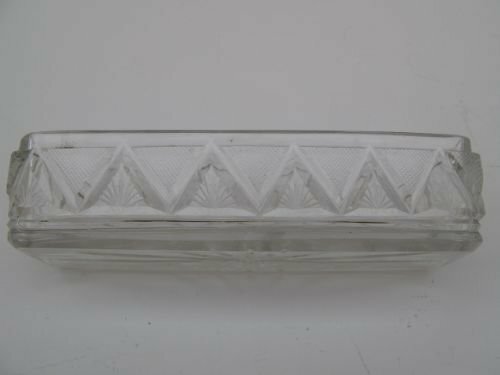 Measuring approximately 3.1/4"long x 1.1/4"wide x 2"tall and retaining its original cushion, it is in very good condition with no damage or repair, one or two very slight dents/dings and the hallmarks are well struck and clear. 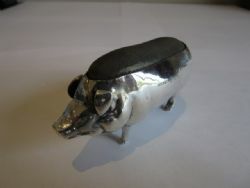 A Large Silver Pin Cushion In The Form Of A Pig. 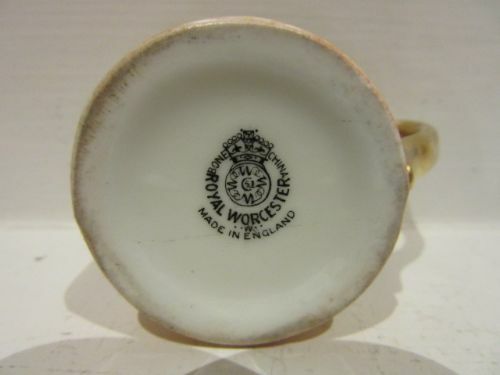 Birmingham 1905. 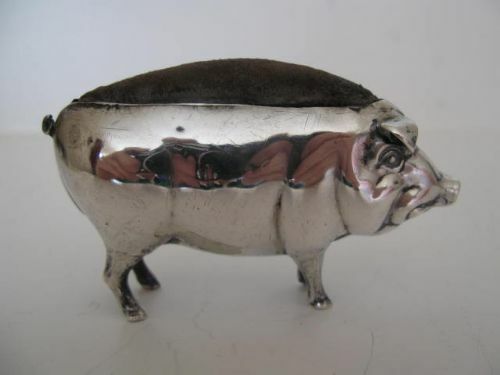 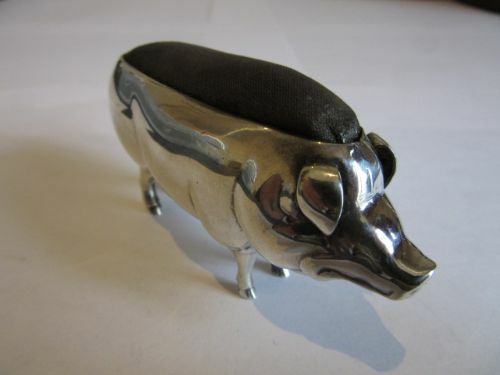 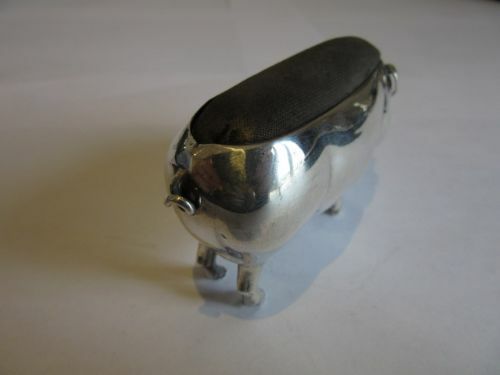 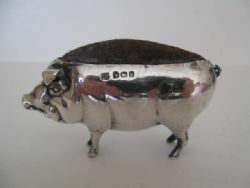 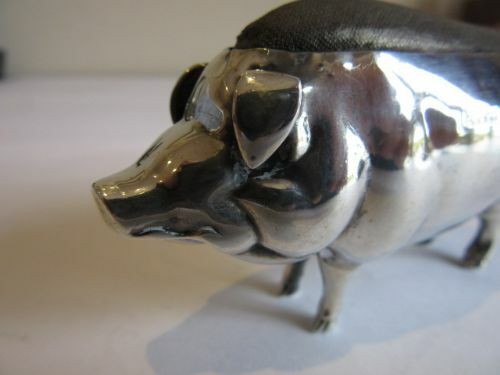 A large, Edwardian solid silver pin cushion in the form of a standing pig. 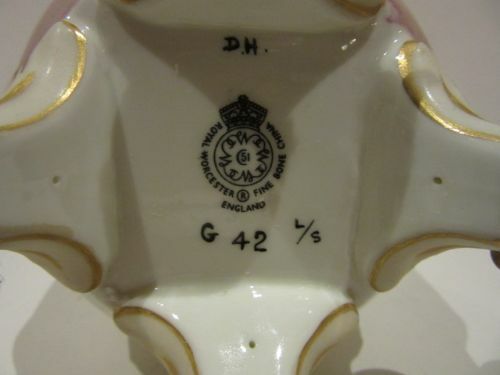 Retaining its original cushion and measuring approximately 3.1/4"long x 1.1/8"wide x 1.3/4"tall, it has clear hallmarks for Birmingham 1905 by Cornelius Saunders and Francis Shepherd and is in very good condition with no damage or solder repairs, and is free from meaningful dents. 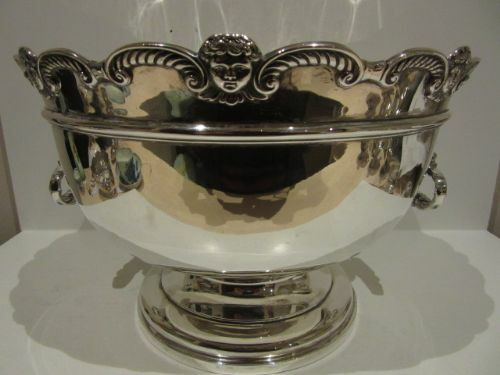 A Large Victorian Monteith Style Silver Punch Bowl, London 1900. 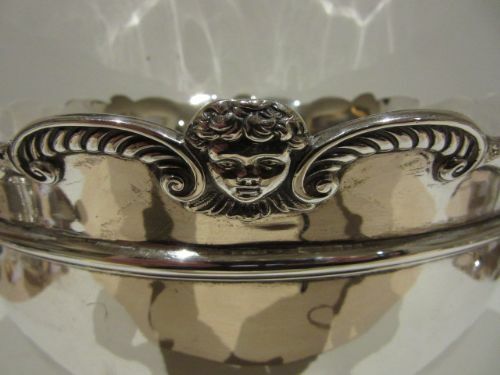 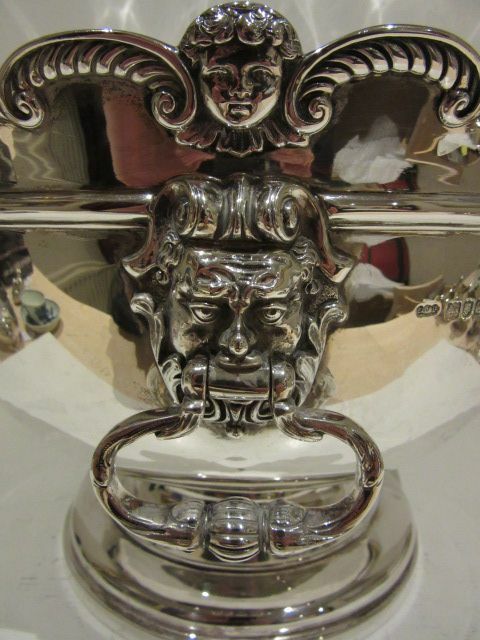 A large and impressive, Victorian solid silver Monteith style punch bowl on pedestal foot, with inverted "C" scroll and cherub rim above the Bacchus-head drop handles. 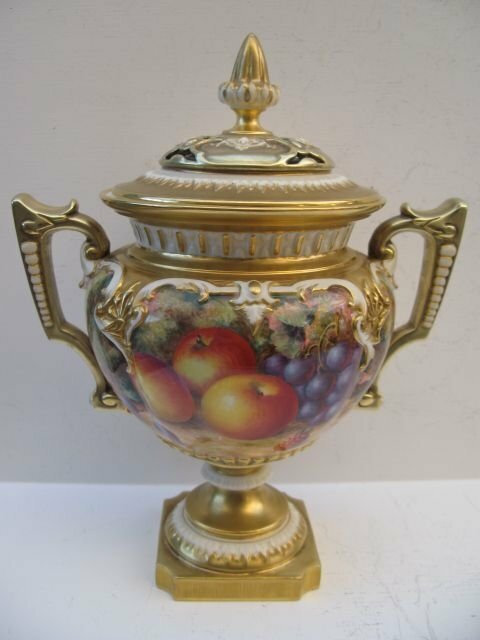 Measuring approximately 12"diameter x 8"tall, it is hallmarked for London 1900 by the highly regarded Elkington Co. Ltd and is manufactured from a heavy gauge of metal, weighing a very impressive 92 postal scale ounces. 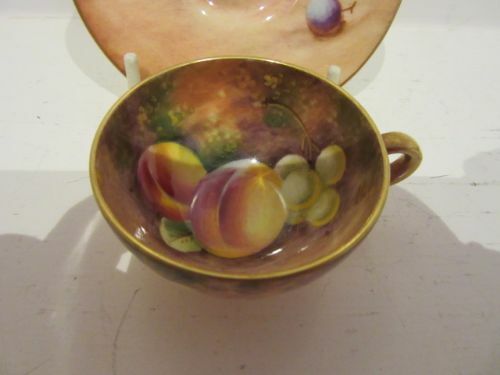 It is in very good condition with only a couple of minor dinks to the bowl and two slight indentations where the handles swing onto the bowl, and no damage or solder repairs. 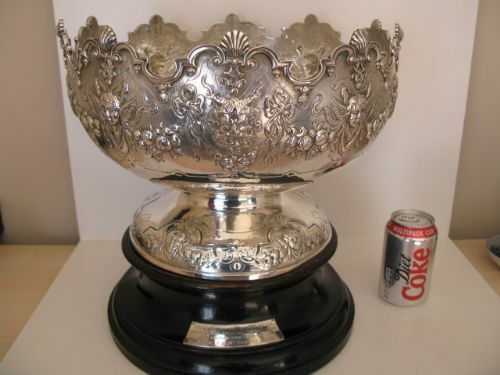 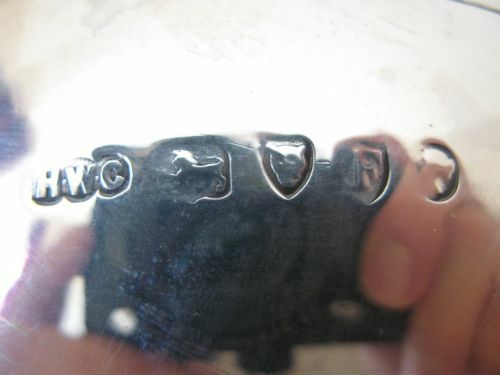 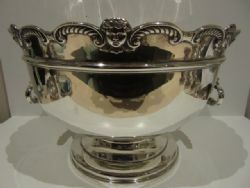 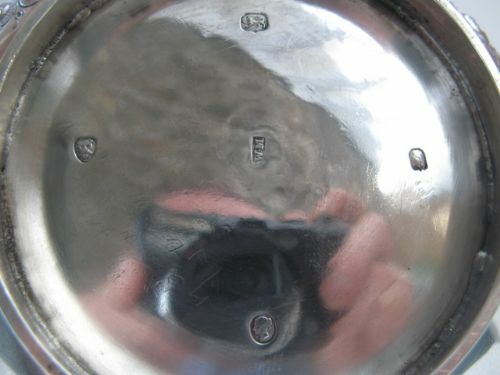 A Large Victorian Silver Monteith Style Punchbowl London 1881, With Very Interesting Provenance. 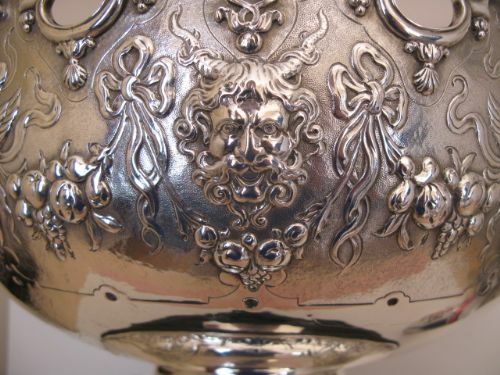 A very large and impressive, Victorian solid silver Monteith style punchbowl, with applied cast silver rim and embossed Bacchanalian vines and grapes, winged cherubs and Bacchus masks. 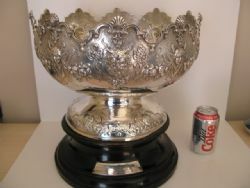 Measuring approximately 14"diameter x 9.1/2"tall excluding the ebonised plinth, it is hallmarked for London 1881 by Henry William Curry and weighs a massive 80 avoir ounces, which converts to roughly 73 troy ounces, and is in very good condition with no damage, holes or solder repairs and only the usual small scratches and a dent to the bowl interior. 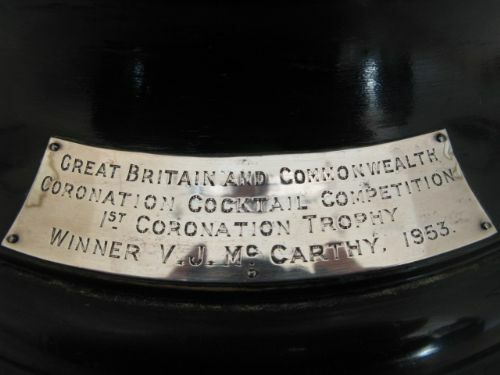 Provenance:- Presented to the winner of the British Cocktail Competition 1953, head cocktail barman Victor J. McCarthy from The Royal Hotel, Southampton, with his creation "Royal Victor". 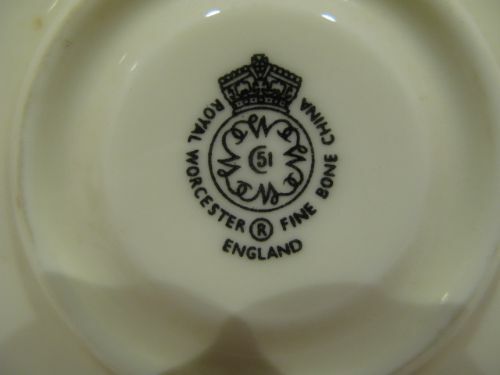 The date was 1953, and to celebrate the Queen's accession to the throne they came from all over the world, 350 barmen who created coronation cocktails in an international contest. 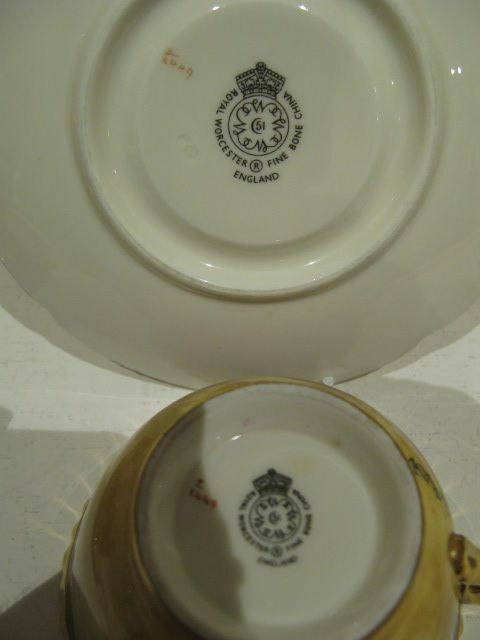 The competition was tough, but finally, a drink named Royal Victor after its creator was judged to be the top tipple! 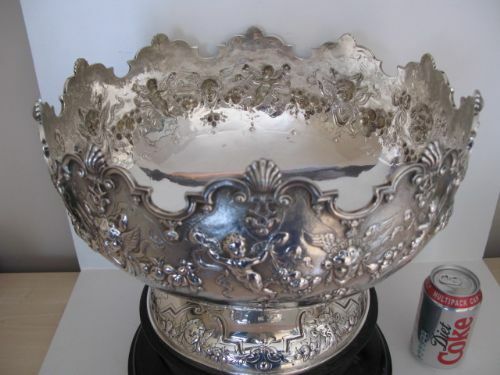 A folder containing photographs of Mr McCarthy with the punchbowl, and newspaper cuttings of the presentation celebrations will be included in the sale. 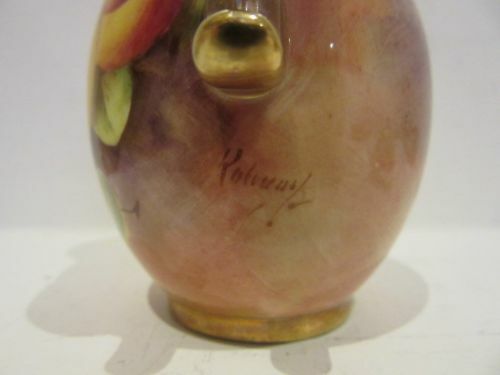 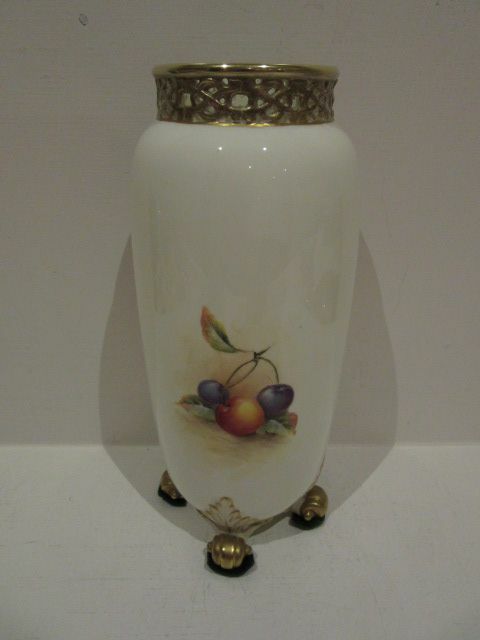 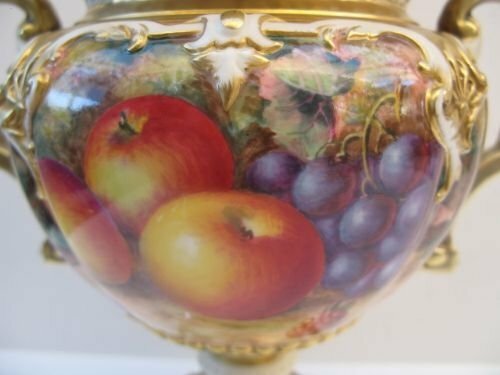 A Large, Royal Worcester Fruit Painted Lidded Vase. 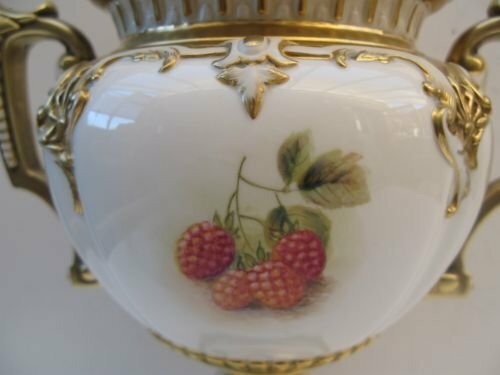 A very good, Royal Worcester two handled lidded vase, shape number H314, with excellently painted fruit decoration by Harry Ayrton. 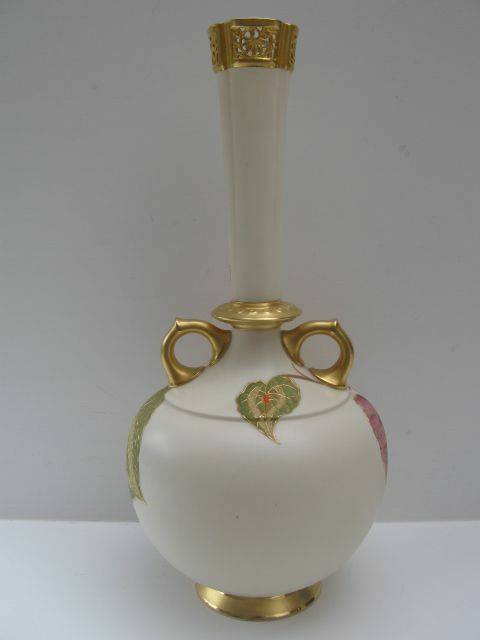 Standing an impressive 11" tall to the top of the finial x 8.5" wide over the handles, it has the black factory stamp for circa 1970 and is in excellent condition, with no damage, restoration or rubbing to the gilding. 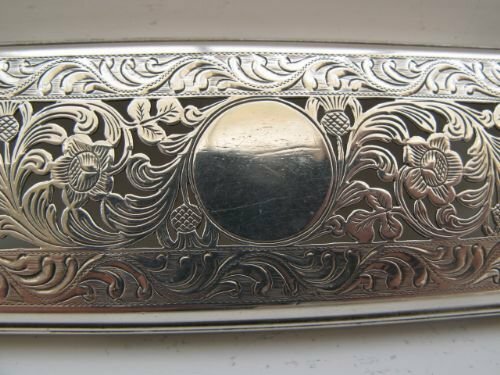 A Late Georgian, Silver Lidded Dressing Table Box. 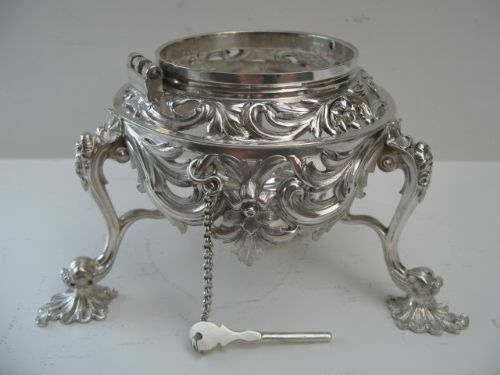 A lovely quality, late Georgian silver lidded dressing table or travelling box, cut glass container. 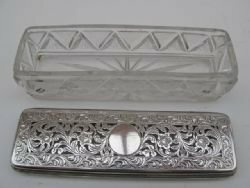 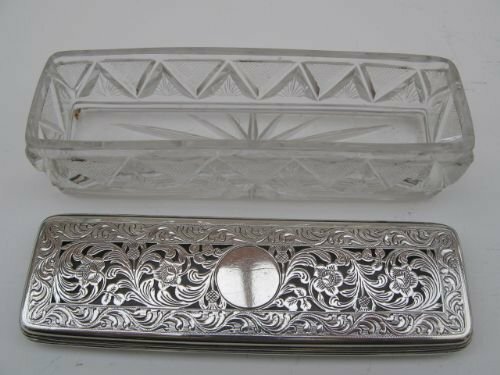 The solid silver lid is finely pierced and engraved with thistles, flowers and foliage, and the cut decoration to the glass box is of super quality. 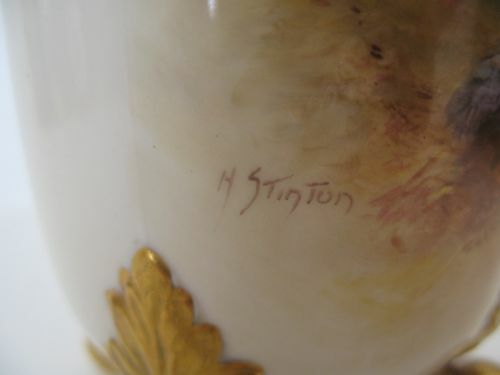 It measures approximately 5"long x 1.1/2"wide x 1.1/2" deep, and has well struck hallmarks for London 1829 by Archibald Douglas. 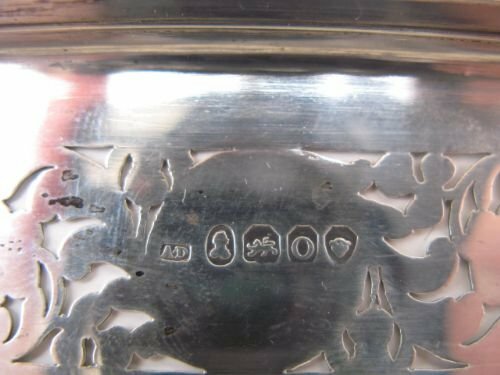 It is in excellent condition with no damage or repair to the silver lid, and again I've struggled to find any nibbles to the glass box, although there usually are one or two little ones. 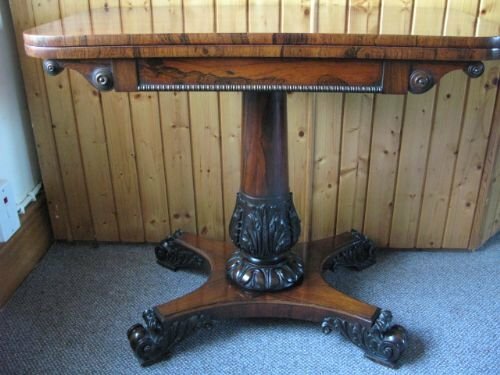 A Late Regency Or Early William IV, Rosewood Turn-Over Top Card Table. 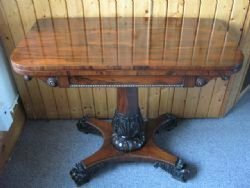 36"long x 18"deep x 29"high. 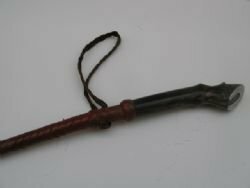 A Leather Riding Crop With Horse Hoof Handle. 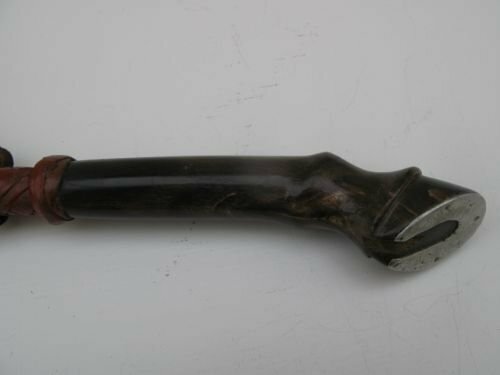 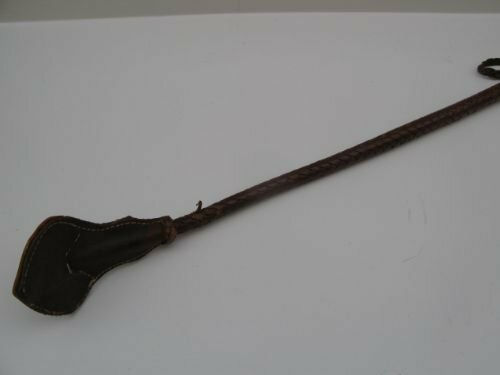 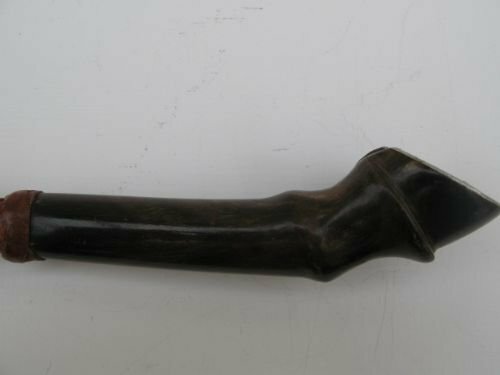 A lovely, late 19th or early 20th century woven leather riding crop, with cow horn handle carved as a horse hoof. 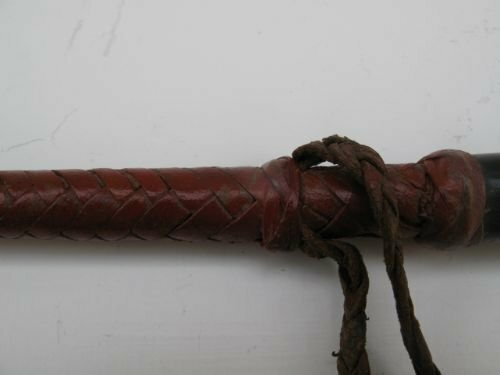 Dating from circa 1900, it measures approximately 24" long and is in good condition, being reasonably straight and with only one small area of worn leather near the tip, as can be seen in picture 2. A Magnificent Victorian Silver Tea Kettle On Stand. 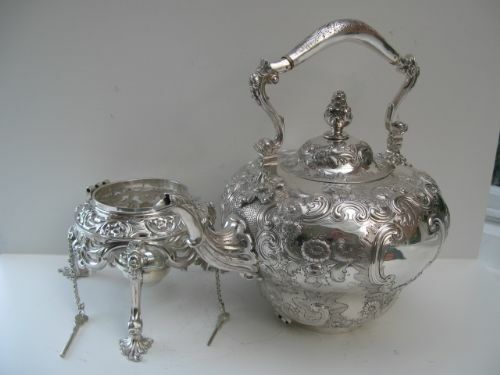 A truly magnificent, and exceptionally pretty Victorian solid silver tea kettle on stand with spirit burner. 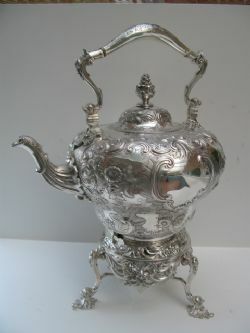 The kettle is heavily repoussed and hand engraved in high Rococo style, with very bold shell, scroll and floral decoration, and the hinged swing-handle is also finely engraved with flowers and scrolls, terminating at both ends with well modelled cast dolphin faces. 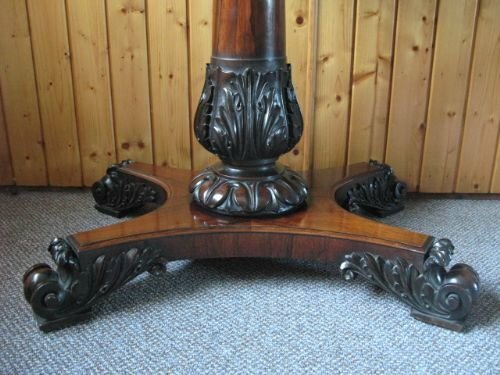 The cast and pierced stand raised on 3 shell feet is also heavily decorated with bold scrolls, leaves and flowers, and is secured to the main body with 2 large and original pins with chains. 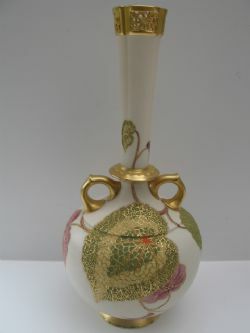 Attached to the 3 feet is a fitting which holds the central removeable spirit burner. 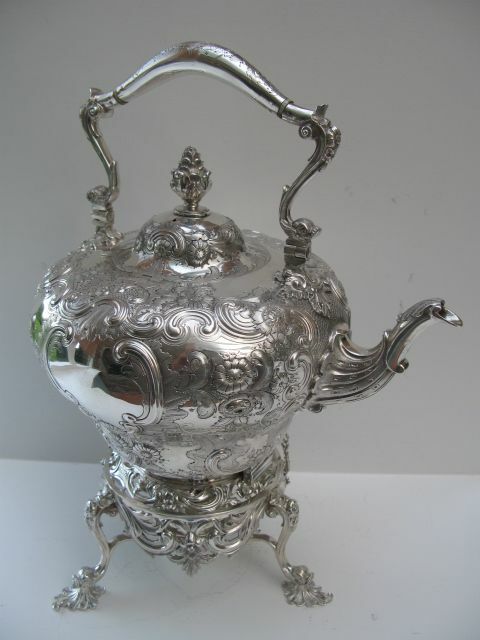 This massive kettle on stand is approximately 15.1/2"high with the handle extended, weighs a very substantial 74 troy ounces and is hallmarked for London 1869 by William Mann. 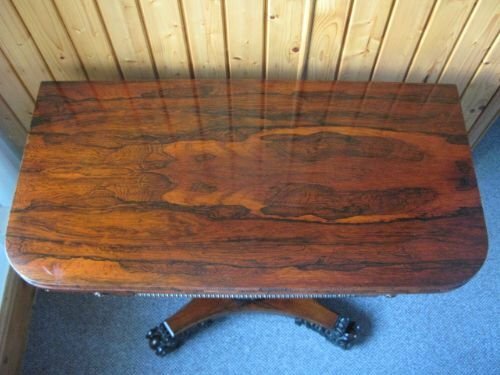 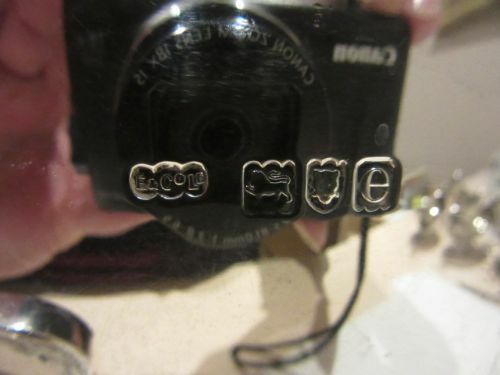 The condition is superb with no damage, repairs or wear, and is as close to mint as is possible. A Matched Set Of 6 Royal Worcester Cups And Saucers. 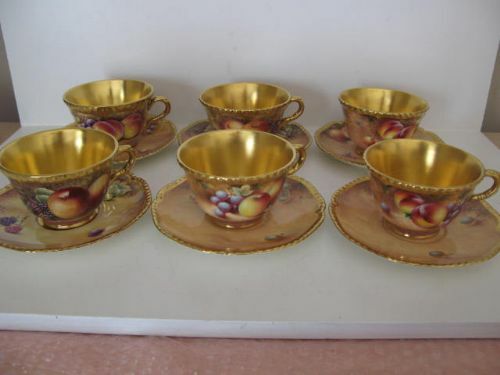 An attractive matched set of 6 Royal Worcester teacups and saucers, with heavily gilded gadrooned rims and well painted fruit decoration by various artists, mainly John Smith but including Frank Higgins, John Cook and Richard Lewis. 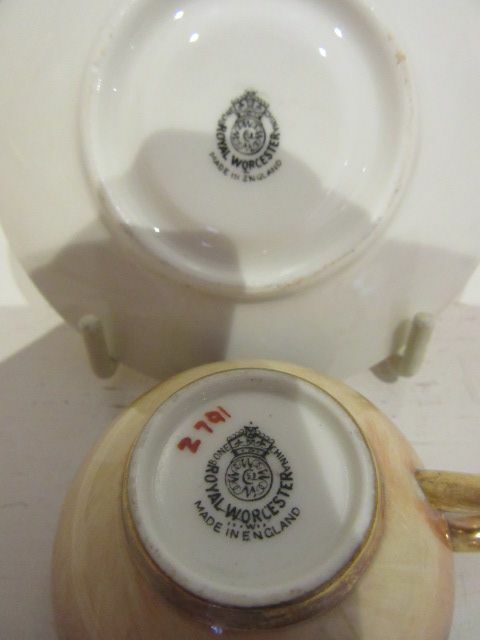 The cups measure approximately 4" diameter excluding the handles x 2.1/2" tall and the saucers 6"diameter, with all having the black factory stamp for circa 1965-1970. 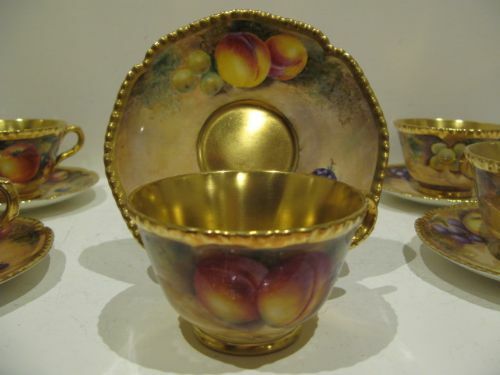 They are all in lovely condition with no damage, crazing or restoration, the gilding is bright and without wear and they appear to have spent all their lives on display behind glass as they have no scratches or scuffing to the centres of the saucers. 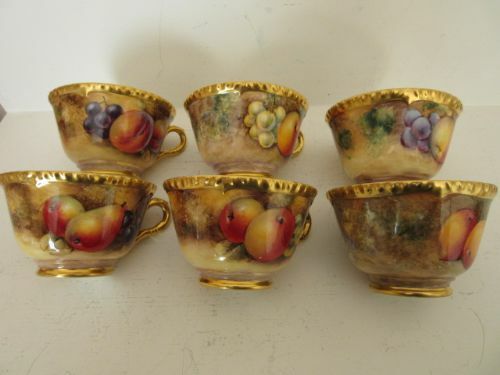 A Matched Set Of 6 Royal Worcester Fruit Painted Cups And Saucers Circa 1970. 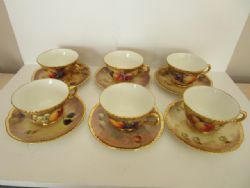 A very attractive set of 6 Royal Worcester porcelain teacups and saucers, with heavily gilded rope-twist rims and nicely painted fruit decoration. 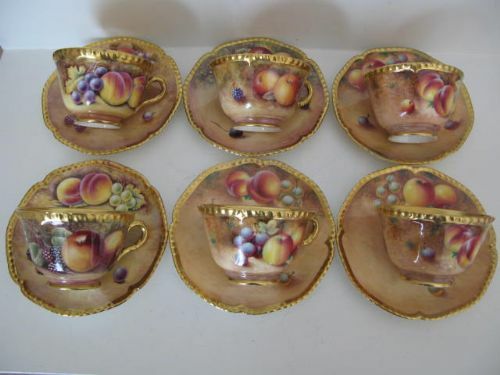 The cups measure approximately 4"diameter x 2.1/2"high and the saucers 5.7/8"diameter with all having black factory stamps for circa 1970, and they are in excellent condition with no damage, crazing or restoration and the gilding is bright and shows only the slightest wear. 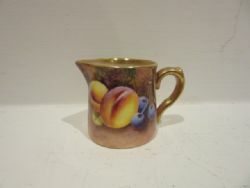 The artists include Bowen, Creed, Smith, Lewis, Rowley and Cook. 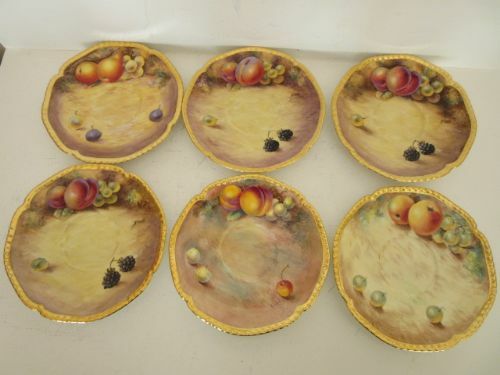 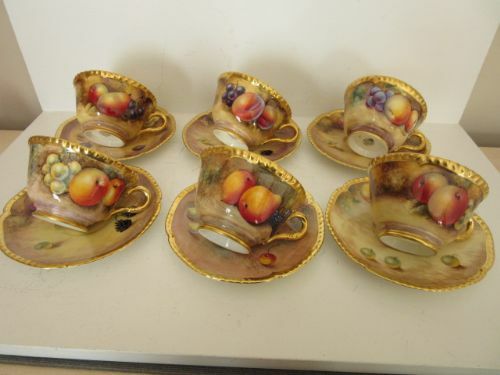 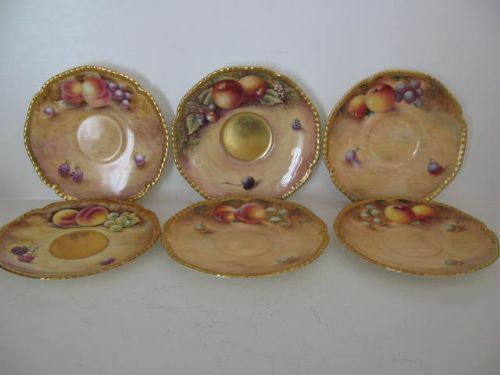 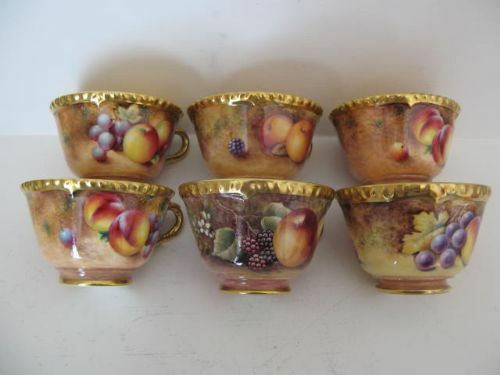 A Matched Set Of Six Royal Worcester Fruit Painted Teacups And Saucers. 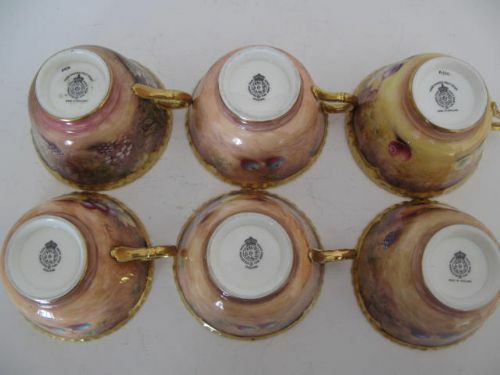 A very attractive matched set of six Royal Worcester porcelain teacups and saucers, with heavily gilded rope-twist rims and painted fruit decoration mainly by William Roberts, but also including James Skerrett, John Fuller, and Paul English. 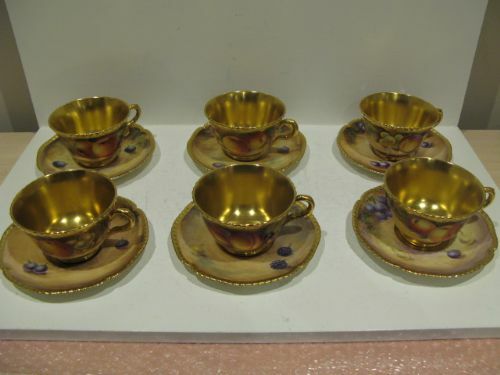 The cups measure approximately 4"diameter at the rim x 2.1/2"tall and the saucers 6"diameter, and all have black factory stamps for 1980'ish and are in excellent condition with no damage, crazing or restoration, and the gilding is bright and unworn. Whilst we would prefer selling them as a matched set of six, we may consider selling individual cups and saucers. 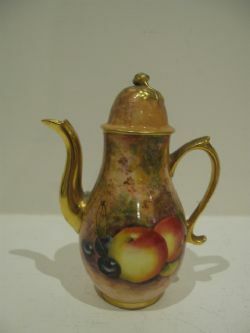 A Miniature Royal Worcester Coffee Pot By Roberts. 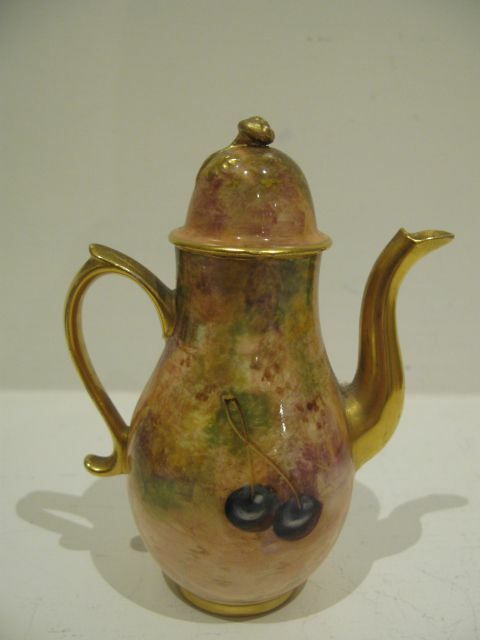 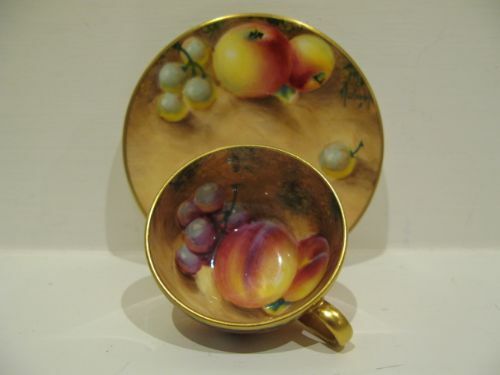 A miniature, Royal Worcester porcelain coffee pot and cover with painted fruit decoration by William Roberts. Standing approximately 5"overall height x 3.1/2"overall width, it has the black factory stamp for 1950 but has a couple of condition issues, one minor, the other not so minor. 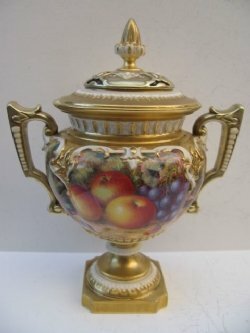 The minor problem is that the pot itself is in reasonably good condition with no damage, crazing or restoration, but does have some gilding wear to the rim and the handle. 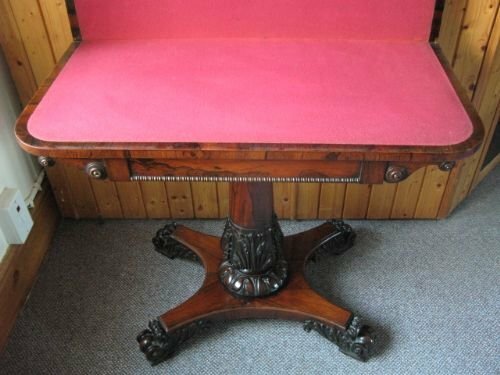 The more significant problem is that the cover, whilst it has no other damage or restoration, has had its finial damaged, re-formed and re-attached. This has been reasonably well done and it looks well on display, but it has been priced to take account of the restoration. 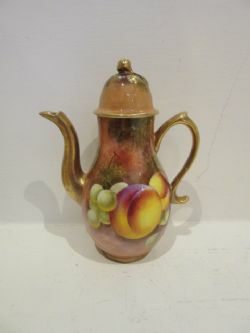 A miniature Royal Worcester porcelain coffee pot and cover, with well painted plum and green grape decoration by William Roberts. 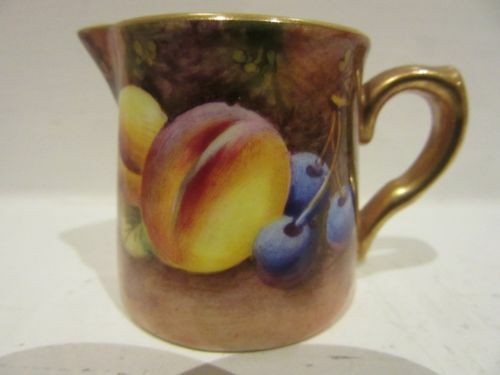 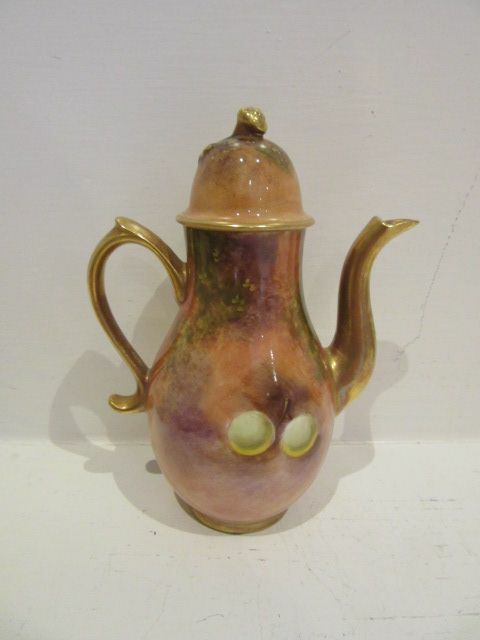 Measuring approximately 4.7/8"overall height x 3.3/4"wide over the spout and handle, it has the black factory stamp for 1954 and is in excellent condition with no damage, crazing or restoration and the gilding is bright and virtually without wear. 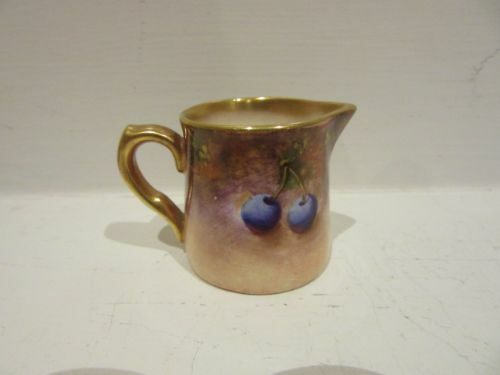 A Miniature Royal Worcester Cream Jug By Roberts. 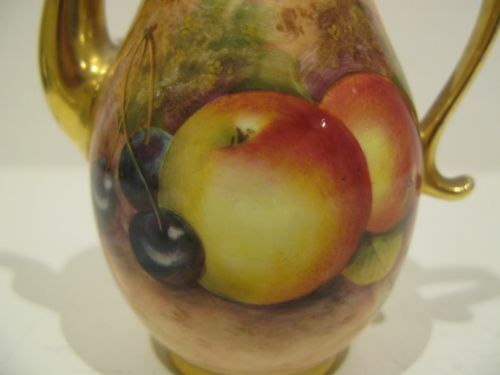 A good Royal Worcester porcelain miniature cream jug, with nicely painted fruit decoration by William Roberts. 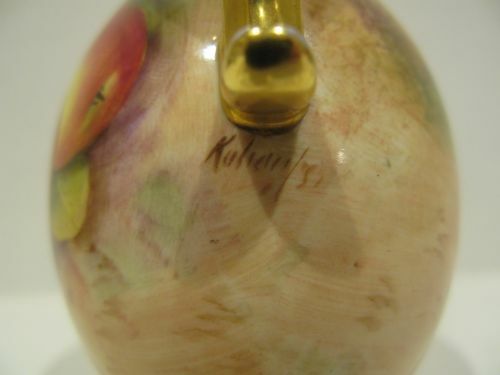 Measuring approximately 1.1/4"wide over the handle x 1.5/8"tall, it has the black factory stamp for 1954 and is in excellent condition with no damage, crazing or restoration and the gilding is bright and virtually without wear. 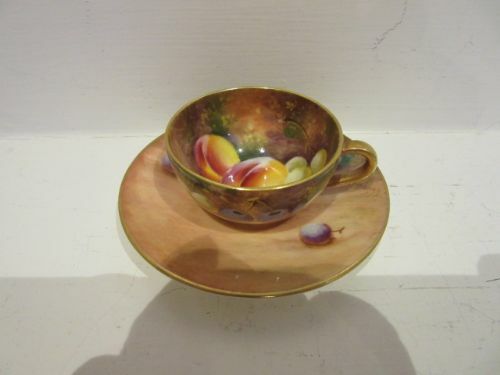 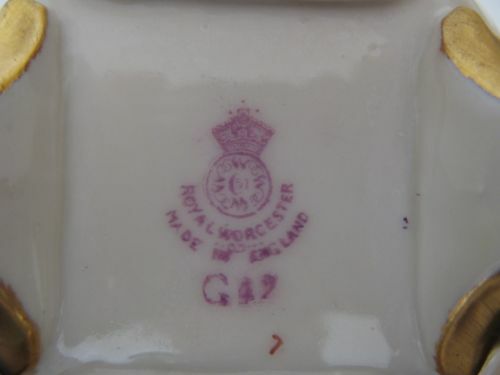 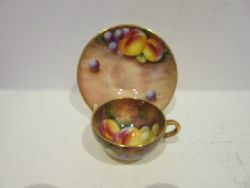 A MIniature Royal Worcester Cup And Saucer By Roberts. A Royal Worcester porcelain miniature cup and saucer, with nicely painted green and purple grape and plum decoration by William Roberts. 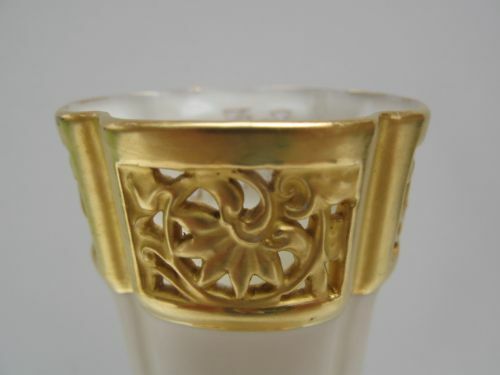 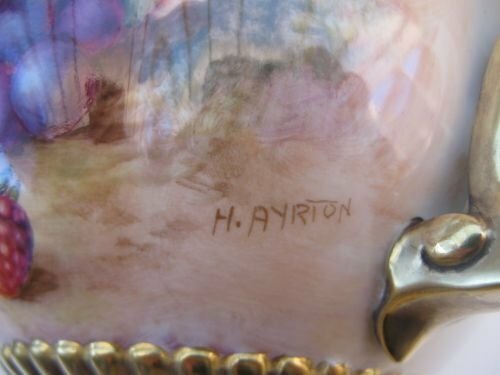 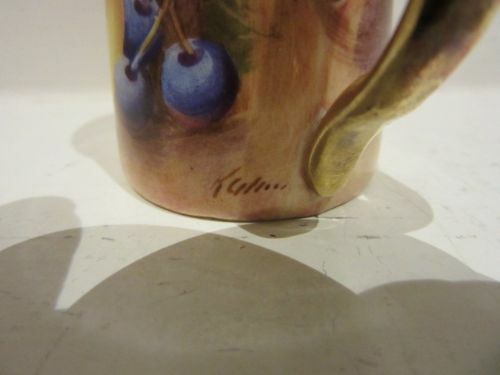 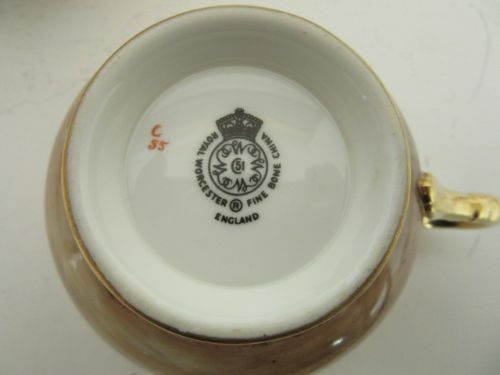 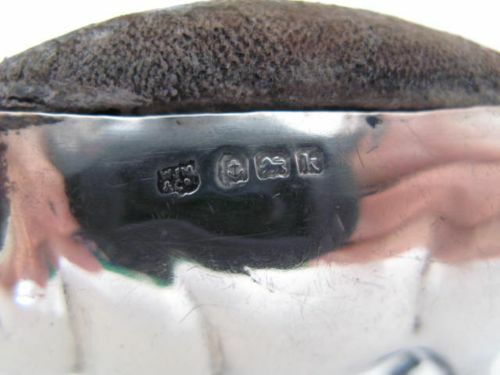 The cup measures approximately 2"diameter x 1"tall with the black factory stamp for 1955, with the saucer measuring 3.5/8"diameter and having the black factory stamp for 1950, and both are in excellent condition with no damage, crazing or restoration and their gilding is bright and virtually without wear. 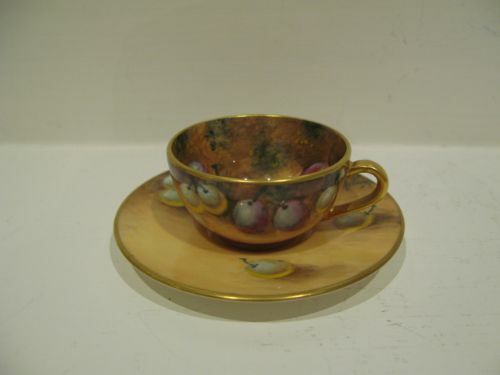 A miniature Royal Worcester porcelain cup and saucer, with well painted fruit decoration by William Roberts. 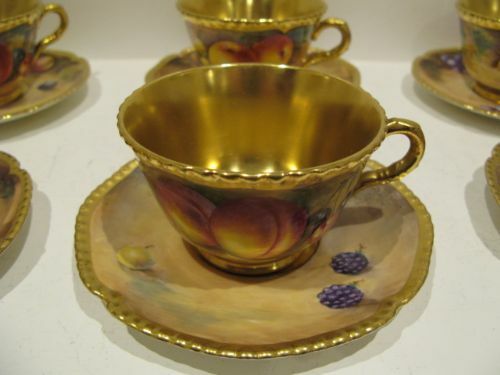 The cup measures approximately 2"diameter x 1"tall and the saucer 3.1/4"diameter, and both have the black factory stamp for circa 1970 and are in excellent condition with no damage, crazing or restoration and the gilding is bright and virtually without wear.